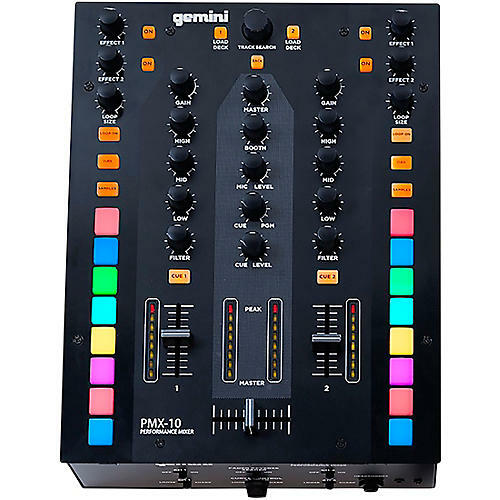 The PMX-10 is a 2-channel DJ battle mixer and MIDI controller. It’s designed to meet the needs of the most demanding scratch DJs. This compact mixer features an adjustable Innofader-ready crossfader. There are eight RGB performance pads per side. A rugged all-metal chassis means the PMX-10 can take a beating and keep on mixing. The PMX-10’s secret weapon is its MIDI and audio interface functionality. Every control on the mixer sends MIDI. This—combined with the built-in 2-channel audio interface—allows it to work as a fully stand-alone MIDI controller. With rock-solid construction, the PMX-10 is ready for demanding use. Hip-hop, scratch and battle DJs are notoriously hard on their mixers. A battle mixer has to be able to withstand intense turntablism techniques, gig after gig. That’s why this mixer has such robust faders, knobs and switches. Not to mention the sturdy metal outer casing. It’s ready to take on any gig. The Gemini PMX-10 delivers a digital mixer, MIDI controller, workflow options, and a soundcard all in one package. 8 responsive multi-color pads per side provide convenient triggering of hot cues and samples, getting the much needed creativity any DJ could want. It’s ready for multiple device connectivity with its combo TRS/XLR mic input and microphone input, recording output, two Phono/Line stereo channels, and more.